Iconic Edinburgh music venue and renowned high-end restaurant join forces to offer residents and visitors fantastic new experience. Concert goers to enjoy stunning 3 course menu ahead of evening of world class music. 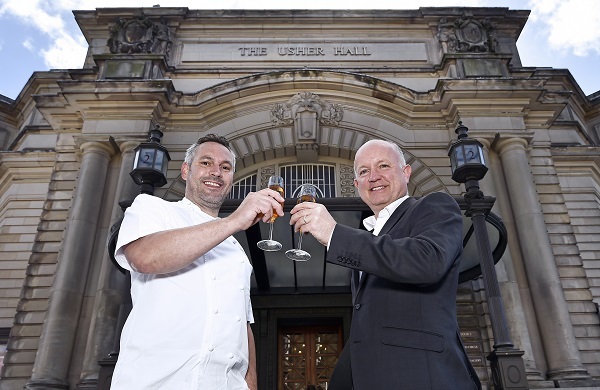 One of Edinburgh’s foremost dining experiences, Castle Terrace Restaurant and Edinburgh’s world class concert venue, the Usher Hall have announced a new partnership offering residents and visitors to Edinburgh an entirely new way to enjoy two of the city’s leading cultural and culinary experiences. From May 15th, a new three course pre-theatre menu priced at only £33 per person will be available to concert goers from Tuesday-Thursday, between 5-6pm. It will be guaranteed to be served within 90 mins, so audiences won’t need to worry about missing the start of the concert. Audiences will be able to book their meal along with their tickets, and Castle Terrace Restaurant will also host the VIP guests and world renowned performers that frequently visit The Usher Hall. Reservations to experience the new pre-theatre menu can be made online castleterracerestaurant.com or by phone 0131 229 1222. Castle Terrace Restaurant opened its doors in the summer of 2010 to introduce a new dining experience to the city of Edinburgh. Combining the culinary expertise and flair of the team behind award-winning Michelin star restaurant The Kitchin, Castle Terrace Restaurant is led by Edinburgh-born Dominic Jack. Nestled underneath Edinburgh Castle, the stylish award-winning restaurant offers a truly unique fine dining experience with a menu created from Chef Patron Dominic Jack’s modern and innovative cooking skills. The restaurant presents modern British cuisine influenced by French cooking techniques and an appreciation of the best ingredients available from Scotland’s outstanding natural larder. The Usher Hall is Scotland’s only five-star concert hall hosting a range of concerts from rock, pop, classical, jazz, world and folk music. The venue has hosted concerts and events since it opened way back in 1914. A beautiful Edwardian building with a modern twist, it is well loved by performers and audiences all over the world. The much praised acoustics make it one of the best concert halls in Europe with many of the world’s finest musicians performing here, including legendary artists such as composers Benjamin Britten, Dmitri Shostakovich, Sergei Rachmaninov and rock bands Queens of the Stone Age and The National and pop acts like George Ezra.